The Camino de Santiago. Considered one of the most important Christian pilgrimage routes after a pilgrimage to Rome and to Jerusalem. The pilgrimage has been well documented for many centuries and follows many different routes, all ending in Santiago de Compostela, Spain - the resting place of the body of the Apostle James after his beheading in Jerusalem. He was transported to the Iberian Peninsula by the other disciples. 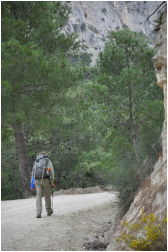 Today, tens of thousands of pilgrims walk the Camino de Santiago each year. There are many routes that cross Europe. The most popular route is the Camino Frances - 769 kilometers from France to Santiago de Compostela. Pilgrims walk for various reasons... as a true religious pilgrimage, as a way to find a new life to their spirituality, or to find a closer relationship with God. Some walk for other reasons... tourism, sport, or simply to take several weeks away from the 'rat race' of jobs and responsibilities and modern technology and unplug by walking all day, every day. Whatever the reason, everyone walks away with new perspective - changed by The Way.